There is always some old knitted scarf that is slightly out of fashion, or your child jumper that is over-grown. Or maybe you can search for the old knitted or crocheted blanket. The fleece is very cosy and any such garment is more than welcome. 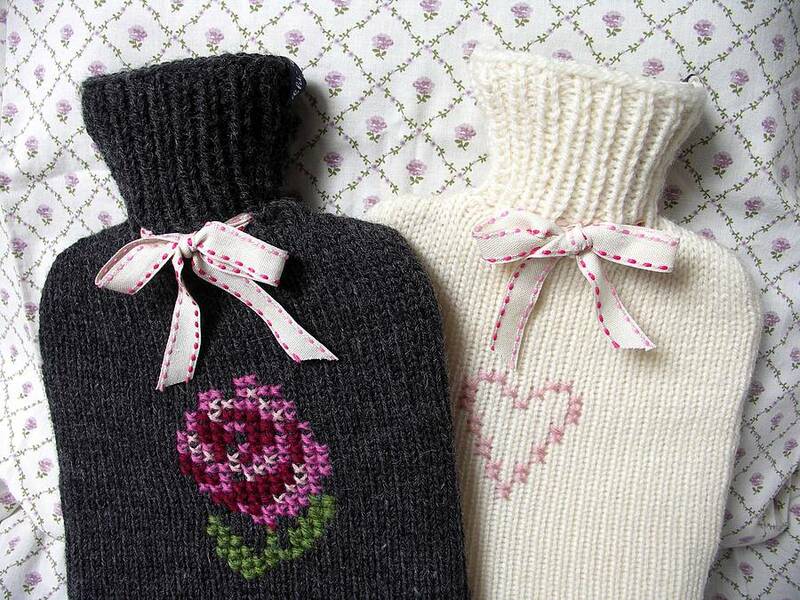 1 You will probably need both the front and back of the jumper to make this cover, because you need to use the welt or finished edge at the bottom of the jumper as the top edge of the hot water bottle cover. 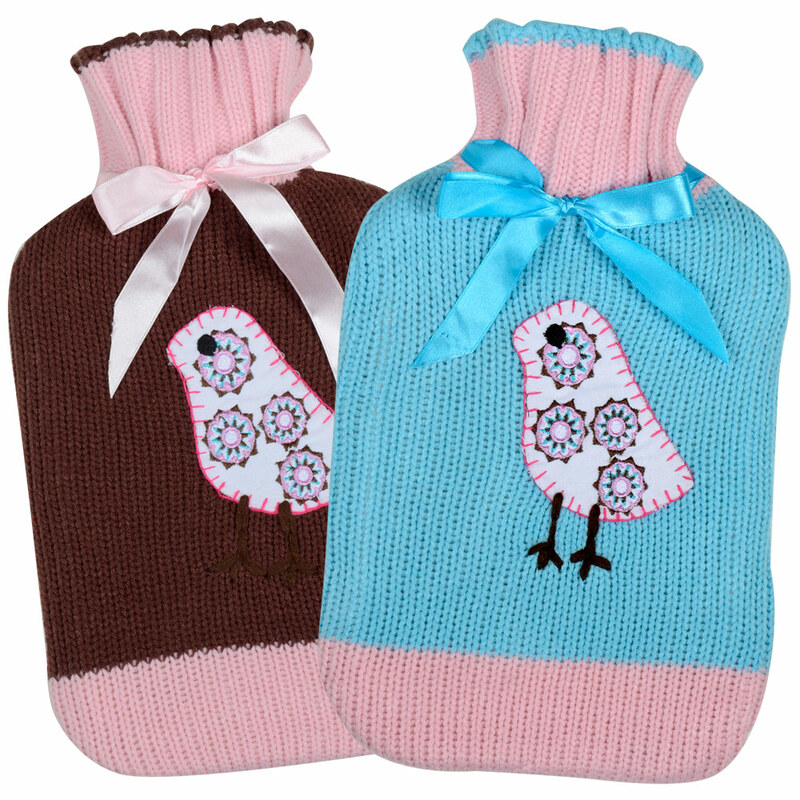 2 Draw around the rubber hot water bottle onto a piece of paper. Then draw a rectangle all the way around this, about 2 cm outside of any of the edges and the top of the hot water bottle. Round off the bottom corners to mirror the shape of the bottle and cut the template out. 3 Have a look at any pattern on the reclaimed knitting that you would like on the front of the cover, then pin the template to the fabric accordingly, with the top edge (where the cover will open) on the finished edge of the jumper. Chalk around the other three sides of the template, remove the template and cut out the cover front. repeat for the back. At this stage you may like to add some decoration on the front side – a bit of embroidery or small application. 4 With right sides facing, pin the front and back of the cover together, making sure the two top edges are level. 5 Then, using quite a small straight stitch on the sewing machine, sew around the three edges of the cover, about 1 cm inside the cut edges, leaving the top open. 6 Turn the cover right side out. Thread the narrow ribbon into the darning needle and, starting at the centre of the front, weave it in and out of the woolen fabric, just where the narrowest part of the neck of the bottle will be, until you have threaded the ribbon all the way around the cover. 7 Double fold and hem the ends of the ribbons so they are neat. Put a couple of stitches into the back of the cover through the ribbon so that it can’t be pulled out. 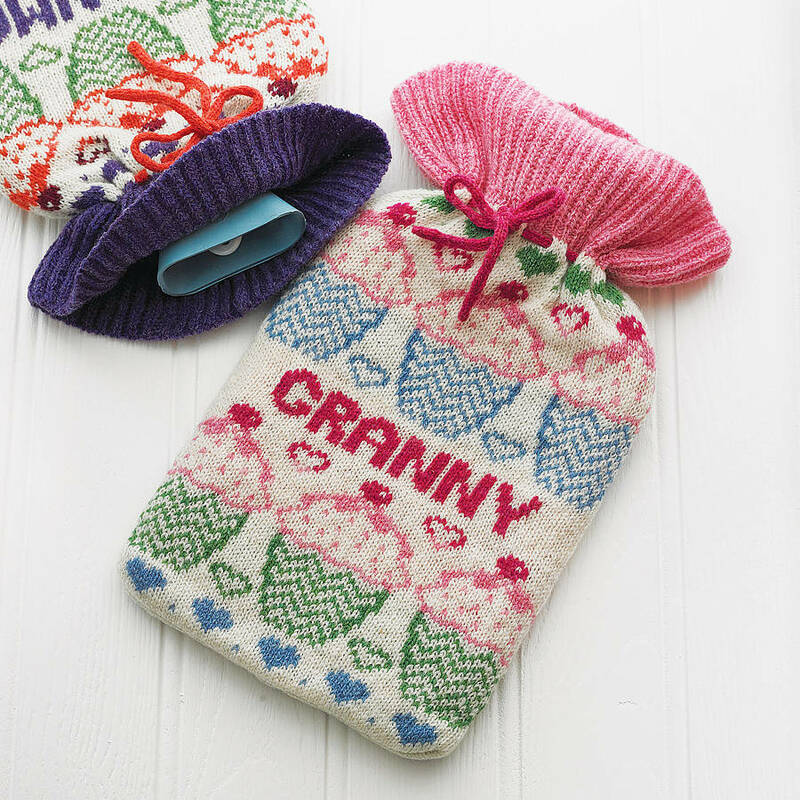 8 Pop the hot water bottle inside the cover, pull the ribbon tight to gather the neck and tie it in a bow.